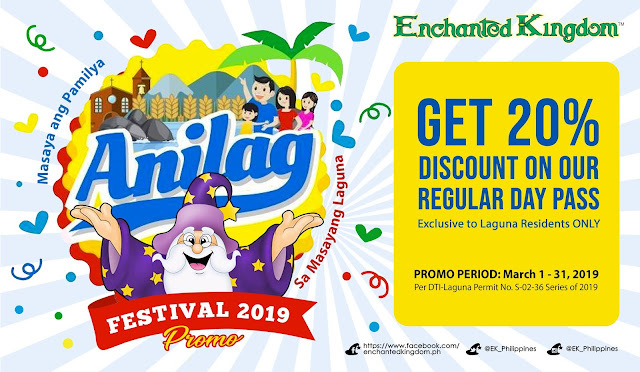 Every celebration must be a magical one, that’s why Enchanted Kingdom prepared this special promo for all Laguna residents! The Anilag Festival Promo entitles Laguna residents to purchase a Regular Day Pass (RDP) at a discounted rate—P640 on weekdays and P720 on weekends. Present your Blue Card ID or any government issued ID with your Laguna address upon purchase to avail of the promo. Each Laguna resident can purchase a minimum of 4 and a maximum of 10 Regular Day Passes per ID, per day! This promo will run from March 1 to March 31, 2019 only. Tickets may be purchased at the Group Sales Office – Santa Rosa and are good-same-day tickets. All tickets cannot be rebooked nor be used in conjunction with any other promos and discounts.